Dr. Heath Prince and colleagues complete working paper on changes in youth employment policy and their impacts in the post-Arab Spring MENA region for the United Nations Research Institute for Social Development (UNRISD). In addition to Dr. Prince, authors include Amna Khan, Deputy Project Director for the Center for Advanced Studies in Energy (a USAID-funded project in Islamabad, Pakistan), and Yara Halasa, Research Associate at the Schneider Institute for Health Policy at Brandeis University and lecturer in the International Healthcare Policy and Management Master’s program at Brandeis University’s Heller School for Social Policy and Management. You can view the paper here. 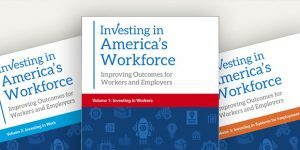 The Investing in America’s Workforce initiative introduces its three-volume book Investing in America’s Workforce: Improving Outcomes for Workers and Employers, with each volume focusing on a particular aspect of workforce development: Investing in Workers, Investing in Work, and Investing in Systems for Employment Opportunity. Hear from more than 100 authors who share research, best practices, and resources on workforce development. The book is the culmination of a two-and-a-half-year collaboration between the Federal Reserve System, the Heldrich Center for Workforce Development at Rutgers University, the Ray Marshall Center at the University of Texas at Austin, and the W.E. Upjohn Institute for Employment Research. Visit www.investinwork.org/book for more information or download the volumes below! If you would like to receive complimentary hard copies, please send your request to rmcinfo@raymarshallcenter.org. Executive Summary: The Austin-Round Rock Metropolitan Statistical Area (Austin Metro Area) is undergoing a period of unprecedented economic growth and prosperity. Total employment in the region grew more than 20% between 2010 and 2015, and the median household income increased by almost 20%. However, not all residents of the Austin Metro Area share in this prosperity. The Austin Metro Area Master Community Workforce Plan (MCWP) lays out a common agenda and establishes a framework for collaboration to coordinate the efforts of the region’s workforce development organizations and educational institutions. The overarching vision for this plan focuses on a more demand-driven workforce system that effectively engages employers, community-based organizations, and educational institutions; empowers residents to more efficiently match employers’ skills needs; and successfully prepares economically disadvantaged residents for good jobs. The MCWP estimates that over the next five years, the Austin Metro Area will seek more than 60,000 middle-skill jobs including both new and replacement positions. Of these middle skill openings, just over 50% stem from just three occupational sectors which compose the primary, though not exclusive, targeted industries as part of the MCWP: healthcare, information technology, and skilled trades. For the region’s economically disadvantaged residents―those who earn less than 200% FPG, many of whom are currently employed―this prospective job growth represents better economic opportunity provided they obtain the skills and credentials required to find higher earnings employment. This report employs a comprehensive qualitative and quantitative examination, including the five major community based organizations providing services [Goodwill, Capital IDEA, American YouthWorks, Skillpoint Alliance, and Workforce Solutions Capital Area] and Austin Community College in its role as a deliverer of workforce training and education. All organizations shared individual-level data linked to Texas Workforce Commission’s Unemployment Insurance wage records to examine outcomes. This report seeks to determine which relevant services and training the region provided and establish unduplicated records across the workforce system during the baseline years to accurately measure the scale of efforts along with the outcomes of participants, including program completion, employment, and earnings. As the region continues to implement the MCWP, this baseline evaluation report serves as a reference to how the system functioned prior to this effort and provides accurate baseline numbers with which to compare results of ongoing and future regional coordination and collaboration. Description: The Student Futures Project—formerly known as Creating a Central Texas High School Data Center—is a research partnership of the Ray Marshall Center, Greater Austin Chamber of Commerce, Skillpoint Alliance, and a growing number of Central Texas independent school districts (ISDs). The project is documenting and analyzing the progress of Central Texas high school students as they move onto colleges and careers. It relies on a combination of student surveys and linked administrative records to improve feedback and policy and program alignment for Central Texas ISDs in preparing students for the demands of adulthood and for success in the workplace. The purpose of the Student Futures Project is two-fold: 1) To provide ISDs, postsecondary institutions, and employers with comprehensive, longitudinal research on what high school students are doing after graduation, why they are making these decisions, and how a variety of educational, personal, and financial factors are related to their success in higher education and the workforce; and 2) To offer workshops, seminars, and applied research on best practices and applied research that will assist ISDs, the Education Service Center, and postsecondary institutions to increase the number of regional youth who obtain postsecondary academic and workforce credentials. • Who is and is not going to college and why? • Who is and is not going to work and why? • Who is both working and going to college? These reports will trace each graduating class as they move through work, postsecondary education and training, and other options for up to four years after graduation. The focus of these reports is to identify trends and practices that best enable students to capitalize on the opportunities they meet after graduation and to ensure that schools have a process for evaluating how they prepare their students for what lies beyond graduation.